One of the top reasons why many tourists plan to visit the Oriental Village is shopping. While it has a number of other attractions and activities packed in the same complex, the many retail and boutique stores and stalls form the central focus in the village. This is also the main shopping complex in the whiole of Pantai Kok area. Of course the famous Cable Car Ride to the peak of Mount Mat Cincang also takes place from here which too is a central attraction. But most tourists would combine both, the ride and shopping to make the most out of their visit to the village. About 70% of the land area in the complex are occupied by retail stores & shops. Imagine that there are some 25 stores which specialize only in selling items like souvenirs, gifts, clothes, T-Shirts, trinkets and other small items. T-shirts and Souvenirs are probably the hottest selling items in the village. The good news is, you will probably get the best deals for most of the items sold here. That's because 1) There are many shops who compete with each other selling almost similar kinds of items, and 2) This is one place where no commissions are given to the taxi drivers who bring you here, which otherwise add up to the price of the items. While the price tags stuck on the items would be competitive, there may still be some room for bargaining, particularly in the small stalls. Actually the shop owners do not mind if you ask for a lower price. They may or may not be able to match your ask, but they still try to do their best. Note that if you are buying clothes or T-Shirts, the stores sometimes offer free gifts if you have purchased items worth more than RM50. 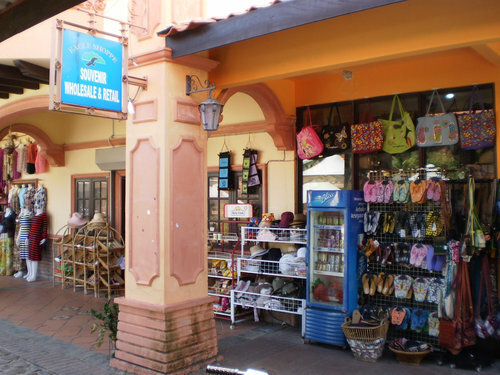 Langkawi Shopping Zone is the single largest retail store in the village selling many different kinds of souvenir items and apparel. They also sell beach wears, toys, eye wear etc. The shop is located close to the Tiger! Tiger! Exhibit & Gallery. There is also a Duty Free shop called The Zon which offers alcohol, tobacco and perfumes at very attractive prices. In fact the price of a bottle of whisky or wine here is probably the cheapest in the island. If you are looking for a bottle, this is an ideal place to pick it up. Asiavenue Gift Shoppe is located right next to the Interpretive Center. 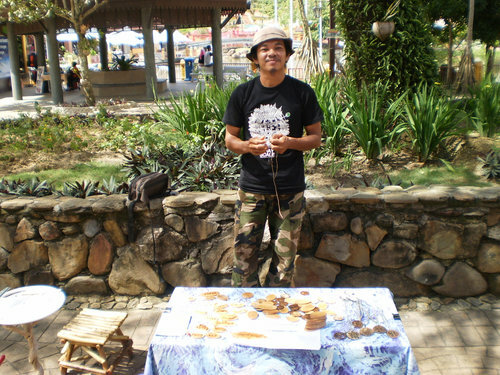 While it has kids clothes and many gift & souvenir items, one of the best buys here is the handmade sandals. You will see lots of them hung up outside. Another nice store to visit here is D'zura Shop very prominently located at a corner. The shop sells a range of items including small carry bags for shopping, kids soft bags, soft toys, picture post cards, batik prints and many other gift & souvenir items. One of the most reasonably priced items here is the beachwear or swimming suits... nice varieties as well. Eagle Shoppe is another popular gift & souvenir store selling handicrafts, batik, hats, bags, hand made slippers and many other items. Our favorite here are the colorful pieces with golden brown eagles (the symbol of Langkawi) imprinted on them with a magnet at the backside. It serves as a great gift and also a memento of the island to take back home. Other items to look for in the village are sunglasses. There are couple of nice stores and even stalls that sell sunglasses at reasonable prices. You will get both branded and non branded ones. Along one side of the lake, there are couple of large shops selling different kinds of art work, paintings and items made of special metals. If you are looking for real cheap items, then check out the kiosks rather than the proper stores. The kiosks or the stalls are even ready to bargain if you don't like the prices. However, there is one thing you won't get in Oriental Village, and that is electronic items. Although the Zon duty free shop sells a few such items of select brands, you won't find any stand-alone branded shops selling electronic goods here. One of our own favorites here is the man making hand crafted letters from wood. Just for RM10, he will make a beautifully designed alphabetic letter right in front of you. He stands in an open space with a small table and his toolkit shortly after you enter though the main gate. There are several designs you can choose from. Once you decide on the letter (may be from your own first name or some one you love) and the design, just tell him. Come back after a while having done some shopping or taken a ride, and it will be ready for you... a great piece for an attractive key ring. I asked the man about what is this artwork called ... from what he mentioned in half English, I thought he said 'Woodcraft Lettering'. There is a Currency Exchange counter right outside the main entrance of Oriental Village. You will also find an ATM at the Maybank next to Telaga Harbor Park close by. Maybank also operates a Currency Exchange counter, but it remains open only during the Banking hours (Monday through Friday) during the day time. Most shops here operate from 9am to 7pm daily. For information for specific day (like a public holiday) contact Langkawi Tourist Information Center at + (604) 9667789. Oriental Village is located at the north western side of Langkawi in Burau Bay (Patai Kok) area. You can take a taxi or a rental car to reach the place. One way taxi fare from Pantai Cenang to Oriental Village is RM26 and takes about 20 minutes to reach. Although taxis are normally available here, during high season I would recommend that you keep the taxi waiting or else you may not find one to return. 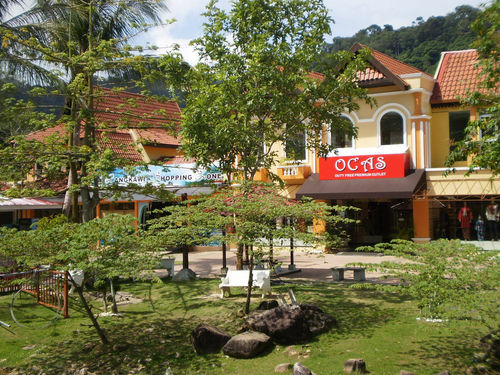 3) Oriental Village: All other attractions & activities in Oriental Village complex.